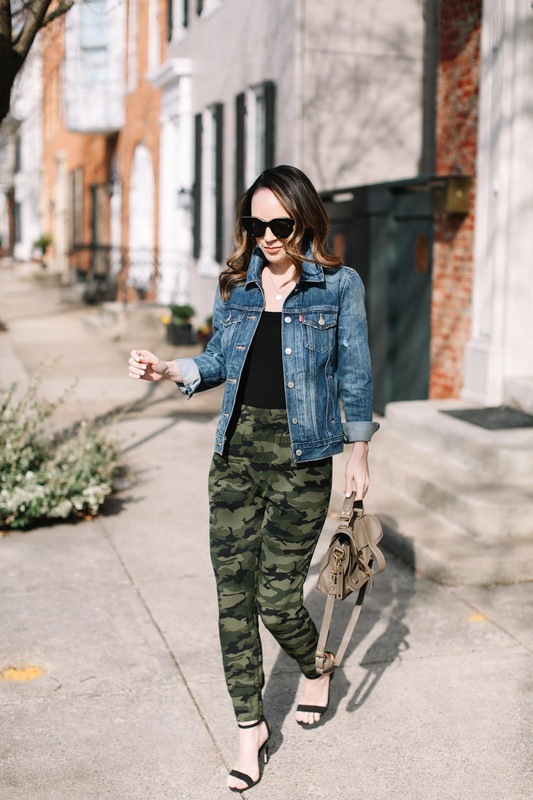 I think many people avoid wearing joggers because they can feel too casual, but I personally love wearing them with heels to dress them up a bit. 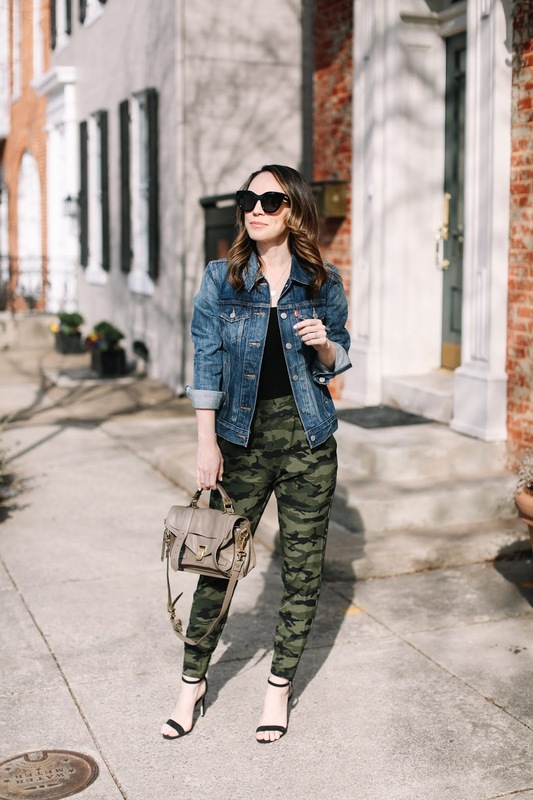 This camo pair has a very slim fit which makes them incredibly flattering and perfect for wearing with pumps or strappy sandals. I initially pulled out my leather jacket to wear with them, but it was a beautiful sunny day so I went with my denim jacket instead since it felt a bit more spring to me. I would also love this look paired with wedges or cute pointy flats as another option. I haven't done a month in review post in quite some time so I thought I would share analytics from the past three months on the most popular selling items from my blog and the most read posts. I personally look at this information daily, but many of you have shared with me that you also love knowing what has been popular from my content and what readers have been enjoying. 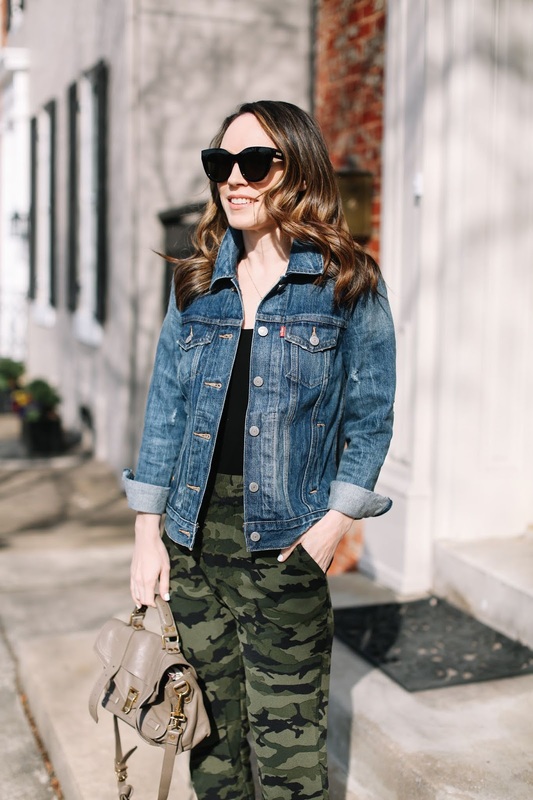 Denim skirt - I picked up this denim skirt (that's under $100) during the Shopbop sale. It's a classic style and the color is perfect. Wrap cardigan - This comes in and out of stock all the time because it is so popular, so I would keep checking back. It's such a flattering cardigan and looks great dressed up or down. 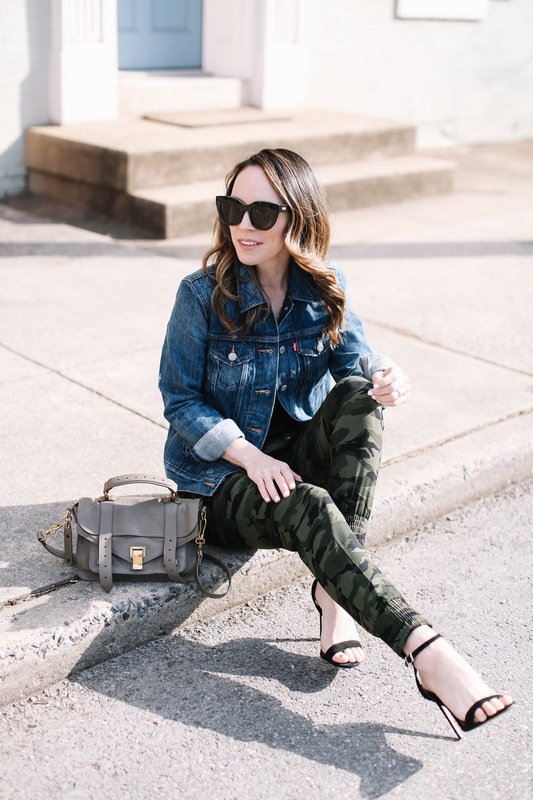 Statement blazer - I received tons of messages from readers who purchased this blazer during the Shopbop sale when I featured it. 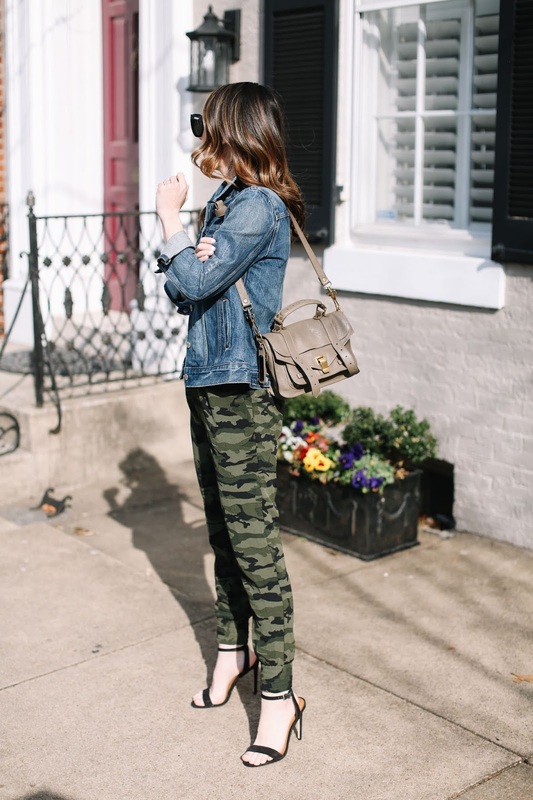 I also styled it in this post and think it is such a great piece to have in your closet (and it's under $100!). 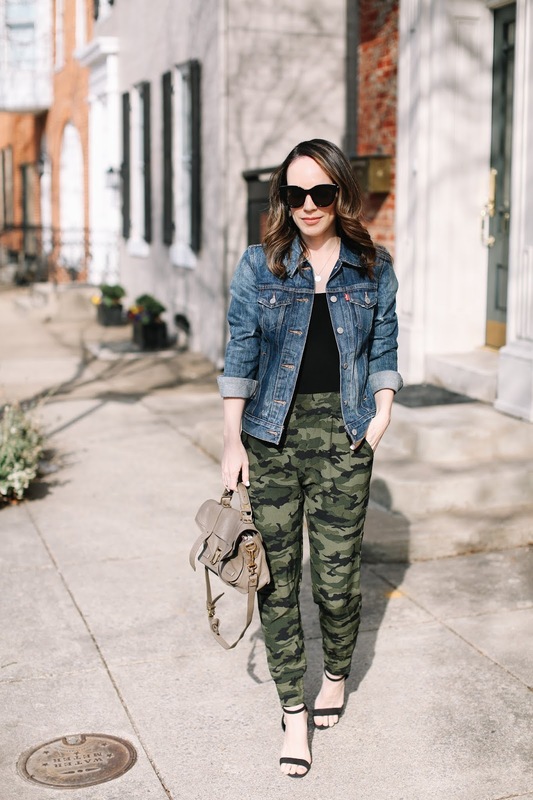 High waisted jeans - I wear these jeans non-stop and have for the past year so I'm not surprised that they were so popular with many of you. Cozy pullover - For the price, this is a great casual piece. I ended up buying one for my mom and myself. Sisley tinted sunscreen - This sunscreen is definitely a splurge, but it has been a holy grail product on mine for years. Dior forever foundation - I bought the newly reformulated Forever foundation and loved it! Ice roller - This roller is so inexpensive at under $12 and feels amazing. Fresh rose toner - I have been raving about this toner for quite some time and love how hydrated it makes my skin. Definitely a must if you need an extra bit of moisture in your skincare routine. Beautyblender - I cannot do my makeup without this and obviously many of you feel the same way! Most read fashion/lifestyle posts from the past 3 months: My Friday Finds posts are by far my most read posts on my blog, and then after that the wellness post where I talked about hydrafacials, my experience with celery juice, infrared saunas and more was my most read post from the past three months. After that, my 12 favorite fashion purchases of 2018 was a big hit. My favorite Netflix shows post and my Shopbop sale haul were both tied for 3rd place. Most read beauty posts from the past 3 months: This NARS eyeshadow palette post with swatches was the most read, followed closely by my readers' favorite beauty products of 2018. The post on all the new Colleen Rothschild launches was next in popularity and then 3 eye creams I've loving right now was right after that. As far as videos go, my Best of Beauty is always the most watched (and is my favorite to record), followed by my winter skincare recommendations to buy from the Sephora sale video and then my new and old favorite retinol formulas video was also a big hit.